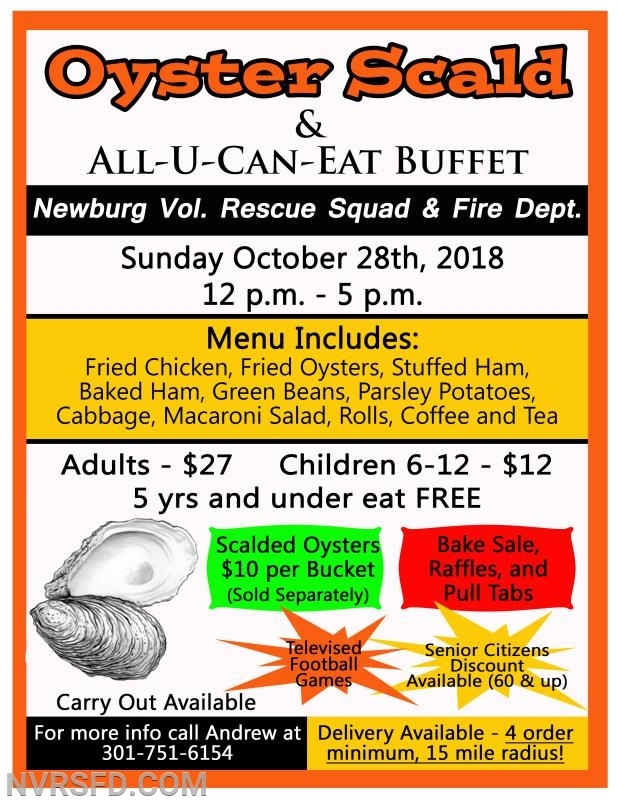 The Newburg Volunteer Rescue Squad & Fire Department will hold it's Annual Oyster Scald and All-U-Can-Eat Buffet! Sunday October 28th, 2018 from 12-5pm! $27 per adult for the Eat In Buffet, $12 for children 6-12, and children 5-under eat free! The buffet includes fried chicken, fried oysters, stuffed ham, baked ham, green beans, parsley potatoes, cabbage, macaroni salad, rolls, coffee and tea! $10 per bucket for Scalded Oysters! Football games will be televised, as well as we will have a Bake Sale and Raffles! Delivery is available within 15 miles with minimum of 4 orders. Call Andrew at (301) 751-6154 and we hope to see you soon!